The Joint Advisory Committee has an annual budget to assist with the implementation of the Management Plan and it targets these resources at the Plan’s Priority Sites and Objectives. Assistance is discretionary and projects will only be assisted if they are unable to receive grant from another source, e.g. Countryside Stewardship, LEADER, etc. Advice is available from the AONB Unit and District Council Officers to enable applicants to submit high quality applications to these other grant schemes if applicable. Funding is available to assist with the on-going management of sites as well as one-off capital schemes. Assistance will normally be in the range of 30-75% of approved costs, but could be up to 100% in certain circumstances. 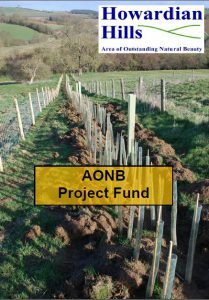 Work may be assisted via either grant aid or direct works organised and funded by the AONB Unit itself. AONB Enhancement – Sustainable Development & the Rural Economy (incorporates the former Sustainable Development Fund (SDF)). For the Natural and Historic Environment themes, a simple 1-page application form applies. For large or complex projects seeking a Sustainable Development grant we may ask for a second-stage application form to be completed, giving fuller details of the project. Applicants will be advised of this once they’ve submitted an initial application form and start discussions with AONB Unit staff.